for a Balanced, Healthy, Abundant, Prosperous & Fulfilled Life! LIFE TRANSFORMATION ~ With Divine Grace there have been transformative SHIFTS in many a Lives, through our Workshops, Individual Mentoring Packages, Readings and Healing sessions. Touched over 700-800 lives through the latest bestseller Book “Angels Speak ~ Your Daily Dose of Divine Guidance” and through various speaking forums and online transformations through guidance, affirmations, distance Healing Box, etc. Let Your Life be the Next One! Connect To Your Inner Mind/Work-Life Balance/Knowing Yourself ~ Customized Workshops for Corporates, Colleges, Businessmen, Working or Non Working Individual or Students for Awakening & Integrating Your Inner Mind to Lead a Harmonious & Fulfilled Life. We discuss with the HR Team, or the Managing Body of the Company, Organization, Club, Institute etc., on what their focus is for their Company and People. As per the requisite needs, we tweak & tailor-make our Workshops to suit the best needs for optimum output & transformation. The workshops focus on key pointers like: To share the organization’s vision by instilling a sense of ownership, pride, love, and harmony, to your down line like colleagues, associates right from the president to the peon or teacher to student and parent for institutional workshops. To understand the essence of the ‘Inverted Pyramid’ theory and how to make best of each person in the organization. Building of trust and delegation in an organization. To know that, peace in your inner world, is the gateway to the divine grace and success in your external world. To bring in that balance of head and heart, quick techniques to deal with daily life devils like stress, anger, hurt, competition, frustration, and such toxins, corporate and individual mindfulness and optimizing of employee potential for the larger growth of the Company and each individual. Angel Soul Therapy Practitioner & Healing Medium ~ A Professional Angel Reading, Healing, Channeling & Medium-ship Workshop – Levels – Two & Three (Done only after the Level One – Empowerment with Angels) for all those who have a calling & life mission to be a part of the Light Brigade of Sparkling Angels in the World. Awakening to Abundance ~ Abundance Manifestation & Moving away from Negative Patterns Workshop for releasing any blocks with Money, Career, Love, Time, Confidence, Business & Welcoming all the Universal Good. Moving towards, listening to the Higher Mind & moving to Higher Frequency, Vibrations & Reaching Higher Grounds. Move from Lack & Failure Consciousness to Abundance & Success Consciousness. Karma, Consciousness & Universal Existence ~ Karma, Consciousness & Universal Existence; are like threads interwoven to become one fabric, that comprises of our entire Lives as a Spiritual Being, living a Human existence. You will have an overall deeper understanding of our Evolution process, Karma, Freewill, life after death & much more that comprises of the very fabric & essence of our Universal Existence. The highlight of the workshop is ending it with a Powerful Karmic Healing meditation to release blockages, patterns, vows & spells carried forward in this Birth. This Healing session will help in removing karmic and lineage (family driven) blocks too. Magic of Life (Children/Teen Workshop) ~ (One for 6 to 12 years and Other for 13 to 19 years) ~ A fun & empowering workshop full of activities, teaching, learning, sharing & tapping into their true Divinity within; at the right & ripe formative ages of their lives between 6 years to 12 years and a separate one, for the Teen Group 13 to 19 years. Journey from You, Me to Us ~ The Relationship Workshop to know & rediscover Yourself & Your Partner, or Parents, Children, Employees, etc. better & Heal any Unwanted Blocks, Issues, that may be blocking the blossoming of a harmonious relationship or work. Spiritual Parenting ~ A workshop to handle all the New Age children, the crystal and indigo children, to handle the karmic and physical responsibility towards special abilities children and having the understanding of the true potential, strengths, weaknesses and their life path ahead. A beautiful workshop to weave a deeper bond and eradicate all and any generation gaps, genetic patterns that may obstructing the path of a happy family life. Trigger to Tripper ~ The Anger & Stress Management Workshop. To understand these lower emotions, their tricks, patterns & simple ways & techniques on how to resolve them to heal your life of toxins that erode you without you consciously knowing about it. Spiritual Awakening Retreats ~ Rejuvenate, Reconnect, Rediscover – Yourself; so dramatically that you see a new You as soon as start implementing this Awakening & co-creating a Great life. 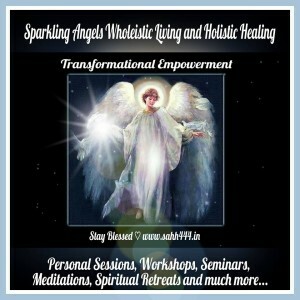 Symbols Power ~ Learn the Key Angelic, Kabalistic and Other Important Symbols and their Healing Powers. Brief knowledge of key Crystals & their Properties is also taught. And Many More Special Customized Workshops for Corporate, Institutes, Individuals and Children. BE THE BEST VERSION OF WHO YOU CAN BECOME.